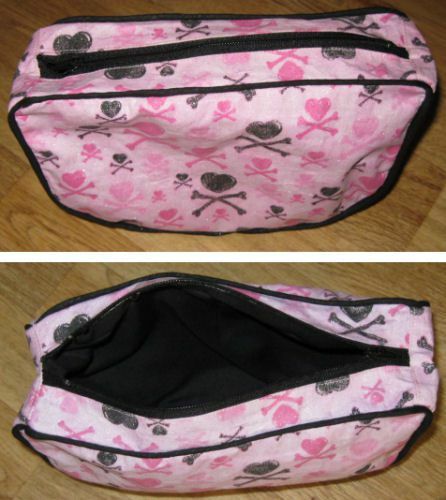 This free sewing pattern sews a small fabric bag which closes securely with a zipper but is large enough to hold all of your cosmetics, makeup or toiletry needs. 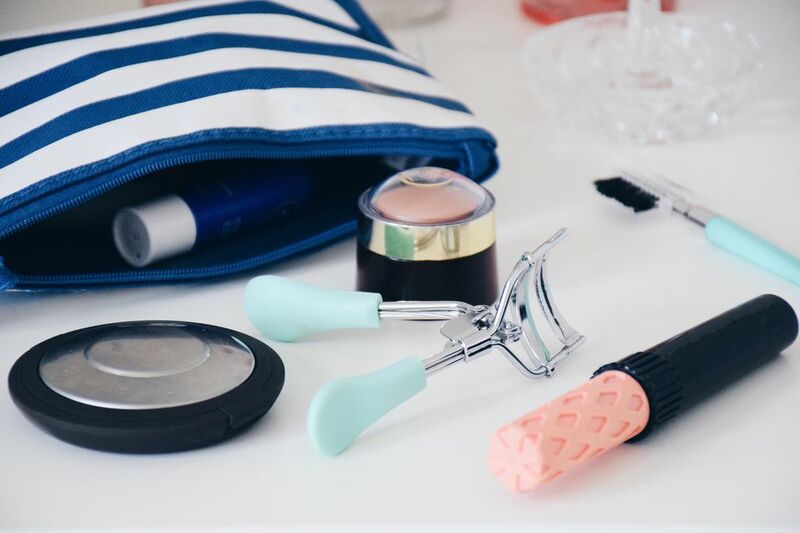 The side section gives the bag a bit of thickness to hold all of your toiletry or cosmetic needs. Use different fabrics to make it easy to pick up the correct bag for the task at hand. Make a special bag for shaving needs, a special bag for your makeup, a special bag for shower needs or a special bag to hold jewelry. No one wants to waste time sorting through their luggage when you are on vacation. This bag is approximately six inches high and 9 inches wide when complete. If you are making one for everyone in the family, consider embroidering names on the center front section before assembling. 1/4 yard of 45" wide fabric for the outside of the bag—a fat quarter can also be used by carefully folding the fabric to obtain enough folds for the pattern pieces. The same amount of lining fabric as outer fabric. This can be the same fabric as the outside. You may want to consider a nylon windbreaker type of fabric so it can be wiped clean. All of the pattern pieces are printed so that they will be laid out on a fold. This means that the edge of the pattern pieces that have a double ended arrow with turned ends will be laid along a fold of the fabric. The fabric is folded keeping the grainline straight or parallel to the selvedge of the fabric. It can be refolded as needed as long as the grainline is kept straight on the fold of the fabric. Cut one of the top pieces and then divide the piece into two equal sections by cutting on the dotted line or center of the piece. Apply optional embroidery to the center of a body piece if desired. Cut out and fuse the pieces one at a time, by cutting out the pieces from interfacing the same way you cut the fabric and lining. The lay the shiny side of the interfacing on the wrong sides of the fabric, aligning the edges. Press to fuse the pieces together. Lay the interfacing shiny side up and carefully arrange the fabric pieces, wrong side down, on the interfacing. Cover the fabric and interfacing with parchment paper and press the fabric and interfacing to fuse the pieces. Cut the interfacing to match the edges of the fabric pieces. The zipper for this bag will be an exposed zipper when it is complete. Use the zipper foot for your sewing machine to sew this zipper to the fabric. Lay the zipper, pull side down, on the right side of a top fabric piece, aligning the edge of the zipper tape with the edge of the fabric, centering the zipper with the length of the fabric. Sew the zipper tape to the fabric sewing 1/4" from the edge. Repeat for the other section of fabric on the opposite edge of the zipper. Topstitch the fabric along the fold, sewing as close to the fold as possible. This will assure that the fabric stays away from the zipper teeth and will not get caught in the zipper. Once joined, the top section, that has the zipper and the side/bottom section, will form a continuous loop of fabric. Lay out the bottom/side section with the fabric right side up. Sew the ends together using a 1/4" seam allowance. Press the seam allowances down toward the long side/bottom section. Top stitch along the top edge of the side/bottom piece to hold the seam allowance back away from the zipper. Find the center bottom of the body of the bag section by folding the pieces as they were cut out and finger pressing a crease in the center of the curved edge. Begin sewing the piping to the right side of the fabric, with the "tail" of the piping out toward the edge of the fabric, using the seam tape of the piping as a seam allowance. Sew the piping to the entire edge of the fabric pieces, clipping and pivoting at the squared corners. End sewing the piping, by overlapping the piping a stitch or tow and taking the end of the piping to the edge of the fabric. Repeat for the second side of the bag. Fold the body of the bag sections in half as they were cut out. Finger press a crease in the top and bottom of the fold. Fold the top/side section in half, matching the seam lines. Finger press a crease in the top/zipper section at the fold and in the bottom at the fold on both edges. Keeping right sides of the fabric together, match the creases of the zipper section with the crease in the straight edge of the body section and pin in place. Align the edge of the side/top with the edges of the bag. Pin the edges in place. Sew the body of the bag to the top/side section, using the stitching line that sewed the piping in place. Pivot at corners as you did to sew the piping in place. The lining varies from the way the bag was sewn in a few ways. On the top sections, press under 1/4" on one edge of each section (to the wrong side). Sew the top sections to the side/bottom section by matching the outside edges of the top sections and the outside edges of the sides/bottom section. Press the seam allowance back toward the sides/bottom and top stitch the edge of the fold on the side/bottom section. Find the center of the body sections and the top/side/bottom section, the same way you did for the bag. Attach the side section to the bag section using a 1/4" seam allowance. Place the bag inside out. Place the lining right side out. Place the bag inside the lining. Align the seams at the end of the top sections, matching the lining to the bag seams. Align the top of the lining opening with the stitching that holds the zipper in place. Slip stitch the lining to the bag, using small stitches to hold it secure.